SOLIDWORKS Routing and Fitting Library software for the creation of Pipe, Tube, and Electrical Systems. Perform routed system design tasks easily and automatically. Speed up the process of routing tube, pipe, electrical cable and harnesses. With SOLIDWORKS Routing, you’ll enjoy greater design efficiency, better designs, improved BOM accuracy, faster time-to-market, and lower costs. Streamline the design of machinery, equipment, small facilities, or anything else that requires routing tubes, pipes along with electrical cables and harnesses. 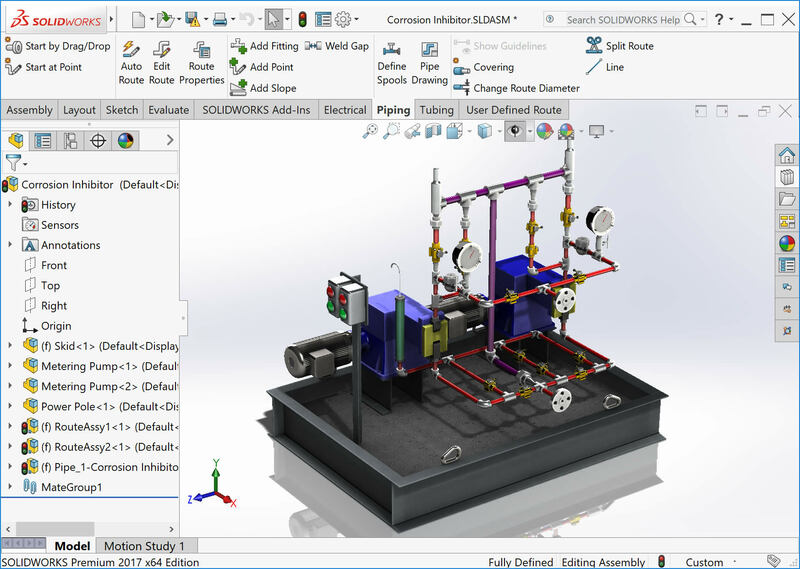 All it takes is SOLIDWORKS Routing, the powerful routed systems design application and fittings library that’s fully integrated with SOLIDWORKS. Intuitive creation and modification of routed systems allows you to quickly and easily design pipe, tube, and electrical routes in your product designs. Drag-and-drop placement, automatic sizing of components (parts or assemblies), copying and mirroring of routes, and auto-insertion of piping bends and elbows. Fast, easy 3D parametric modeling of tubing, piping, and electrical cable and harness systems within complex product or equipment designs. Auto-routing of tube, hose, and electrical cable and harness segments directly or through mounting clips and hangers. Time-saving library of ready-made tubing, piping, and electrical cabling and harnessing components. Automatic creation of engineering drawing and bills of materials with complete information, including cut lengths for pipe and tube routes. Specialized capabilities including creation of bend data files for CNC tube- and pipebending machines and efficient creation of penetration cuts involving pipes and tubes. Easy reuse of data created with electrical CAD software and other tools when creating new cable and harness route designs, importing data conveniently in the Microsoft® Excel format. 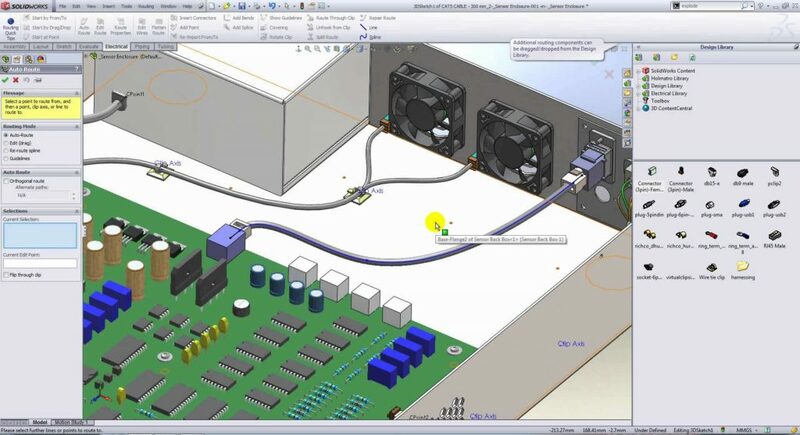 SOLIDWORKS Routing provides designers of electrical and electronic systems with additional timesaving tools for generating cable and harness manufacturing documentation. Flattening of 3D electrical cable and harness routes in order to create drawings and related documentation easily and efficiently. Creation of automatic reports including wire list, wire summary, harness bills of materials, and harness connection information. SOLIDWORKS Routing uses the familiar SOLIDWORKS 3D mechanical design environment, so it’s quick and easy to use. Your routed systems design is created in the same integrated package as your equipment design. The SOLIDWORKS Routing Add-in is part of the SOLIDWORKS Premium software bundle from Javelin. Interested in the SOLIDWORKS Routing Add-in?